The near-universal adoption of smartphones and social media has fundamentally altered the science of complaints. Critics ("haters") can now express their displeasure faster and more pub­licly than ever. These trends have resulted in an overall increase in complaints and a belief by many businesses that they have to "pick their spots" when choosing to answer criticisms. ·Offstage haters. These people simply want solutions to their problems. They complain via legacy channels where the likelihood of a response is highest—phone, e-mail, and com­pany websites. Offstage haters don't care if any­one else finds out, as long as they get answers. Hug Your Haters shows exactly how to deal with both groups, drawing on meticulously researched case studies from businesses of all types and sizes from around the world. It includes specific play­books and formulas as well as a fold-out poster of "the Hatrix," which summarizes the best strate­gies for different situations. The book is also filled with poignant and hilarious examples of haters gone wild, and companies gone crazy, as well as inspirational stories of companies responding with speed, compassion, and humanity. Whether you work for a mom-and-pop store or a global brand, you will have haters—and you can't afford to ignore them. 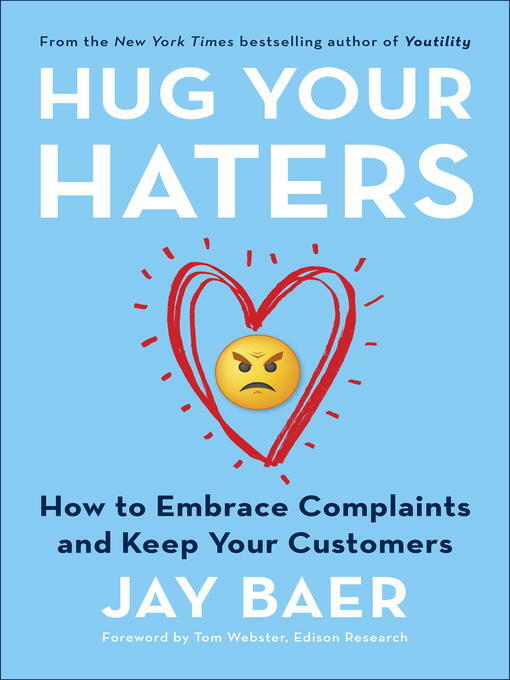 Baer's insights and tactics will teach you how to embrace complaints, put haters to work for you, and turn bad news into good outcomes.